A total of 86 metro stations are identified for Mohalla Clinics by Aam Admi Party government in Delhi. 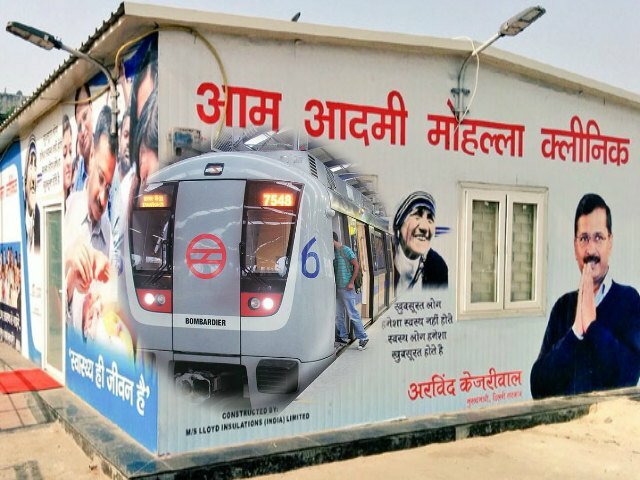 New Delhi, Metro Rail News: Delhi Government has fixed the target to start 1,000 one-bedroom clinic by March next year and the clinic has been finalized for most of the place. Now 187 are located in Mohalla Clinic. Mohalla Clinics will also be made in Delhi Metro station premises. A senior official of the Delhi Government said that 86 locations of DMRC has been finalized for the Mohalla Clinic and 12 of them have got NOC for the Metro station. Work will start here soon. Aam Admi Party government in Delhi is all set to open 86 Mohalla Clinic at Delhi Metro Stations. The Aam Admi Party government has already identified the metro stations and the Health Department Officials have already visited these marked metro stations. These stations are mainly on the busiest route where the passenger’s movement is high. Kejriwal government in the national capital has set the target of constructing 1000 Mohalla Clinics across the state. According to Delhi Metro Rail Corporation (DMRC) officials, a team of health department officials has visited the different sites on various metro stations. A total of 86 metro stations are identified for Mohalla Clinics. More than 600 sites have been given NOC and around 333 of these places will start to become a Mohalla Clinic from next month. In December, some new Mohalla Clinic will be inaugurated. Along with the Mohalla Clinic, schools will also start becoming a health clinic in the coming months. 265 School Health Clinic has also been given a green signal. According to the cluster, the Mohalla Clinics will be built in schools. Surveys are being done to identify which schools will be formed and a cluster will be built and children of two to three schools have plans to make a health clinic at one place. These identified stations are under the direct control of DMRC and therefore doesn’t require any no-objection certificate from another department. Chief Minister Arvind Kejriwal has recently held a review meeting regarding Mohalla Clinics. As per a senior Delhi Government official, work will start very soon on 12 metro stations. Health Department is allocated 300 square meters area on metro stations for the Mohalla Clinic. It is expected that several passengers commuting on metro routes will be benefited from this scheme. According to the information, Delhi has got the place from Delhi Urban Shelter Improvement Board (Deutsibe) for 100 Mohalla Clinics and the Revenue Department has also finalized the space for more than 100 clinics. The health clinics created in government schools will be completely AC. These clinics will also be on the model of Mohalla Clinic. There will be a doctor and assistant in these school clinics and children’s health checkup will be done on regular basis. In these clinics, children’s disease screening, anemia, nutrition, hearing problems, vaccination, dental checkup, as well as health education promotion will also be done.